Just had to follow up the last entry with a photo. 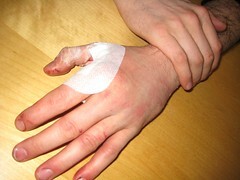 We're planning a public service announcement against aggressive biking...."This is your hand now. This is your hand after it has been run over by a bus."